I love shawls for those days when I’m feeling introspective. It can be so comforting to have something to hold onto in the wind. It was a sort of a cloudy day. Flowers helped to brighten the day for me and the gold umbrella added an extra magic bounce to my walk. 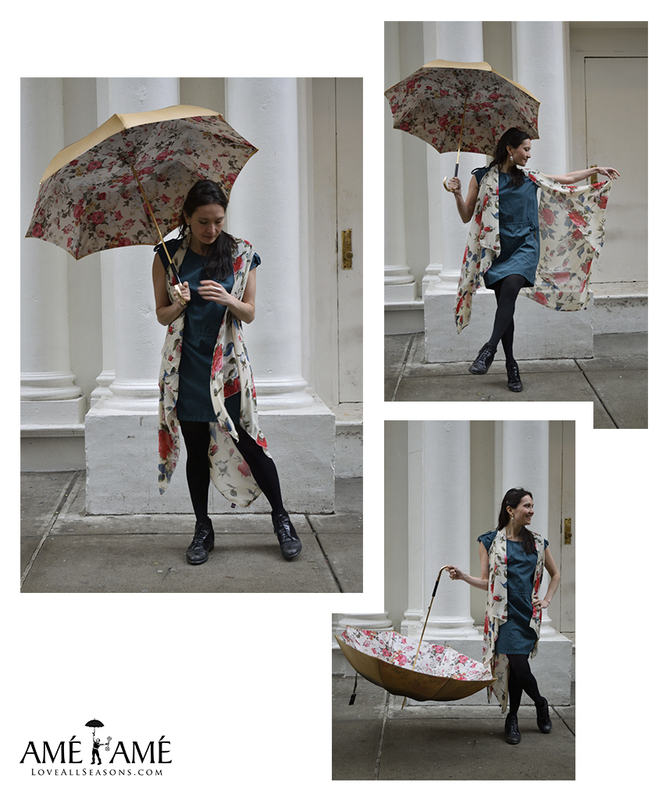 Looking for a gold umbrella or a floral pattern shawl for yourself or as a gift? Amé Amé has them! Amé Amé is located at 17 W 29th Street, NYC, between 5th avenue and Broadway—just across the street from the Ace Hotel. This entry was posted in Uncategorized and tagged gold umbrella, where to buy floral shawls in nyc, where to buy flower parasols in nyc, where to buy flower shawls in nyc, where to buy flower umbrellas in nyc, where to buy gold umbrellas in nyc, where to buy shawls in nyc, where to buy silk shawls in nyc by AmeRain2. Bookmark the permalink.